"As a solo female over 60 years, I debated whether to do the trip on my own or join with a group. I am very grateful that I chose to join with a group organized by Camino Ways. It was a wonderful group from different countries, with a bilingual guide who provided us with details each day. Prior to departure Camino Ways sent all the details about hotels, the walk each day including sites to be aware of and elevation for each day, and the pilgrim passport and luggage tags. From the start of being met at the airport, efficiency was the key. Our leader Oli was wonderful, patient and informative. All in all a good experience, more difficult than I anticipated but I did it! I would suggest Camino Ways recommend that people get walking poles when they arrive, I had great sticks that were confiscated at the airport in Madrid by security. They were quite expensive and high quality. This was disappointing but I did not let it ruin my trip. Two of us in the group had our sticks taken, others had toiletries confiscated. No rhyme or reason with airport security. Camino Ways also has periodic webinars that are worth joining and staff are very responsive to emails while you are planning. This was harder than I anticipated, but after the first two days, it seemed to get easier. It was great to cover the trail with a group - while we did not walk together we met for breakfast in the morning and dinner each evening. The trip brought complete strangers together as friends and supporters to each other. I am proud of my accomplishment in completing what I set out to do. Camino Ways from Ireland did a great job in organizing all the details of lodging, etc. and was reasonably priced." We had a wonderful and memorable experience. "My booking experience was good it was my first booking with Camino Ways and I was a bit unsure but everything ran so well. Im hoping to have another group next year. Many thanks to Richard and Claire. I had a group of 15 adults 17-24 Apr and the feed back from all was excellent they were all full of praise. Thanks"
If you are looking for the classic Camino experience and are keen to do it guided as part of a group and also experience the celebrations of St James’ Day, then this is the tour for you! This Camino guided tour takes you to the last stage of the famous Camino Francés, walking 111kms in a week. This stretch from Sarria to Santiago is the most popular among pilgrims and perfectly captures the essence of the Camino de Santiago. 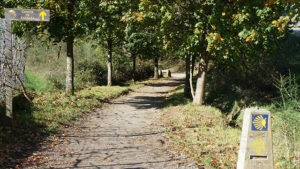 Stroll through the luscious green Galician countryside in the company of your group and our friendly, knowledgeable English speaking guide who will give you an in depth insight into the unique history of the Camino as well as the sights, flora and fauna of Galicia. Meet fellow pilgrims, discover local traditions and get your pilgrim passport stamped as you walk through woodlands, farmland and rustic hamlets. 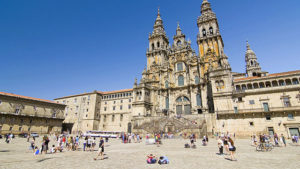 Once in Santiago, get your ‘Compostela’ certificate and explore the magic of the Old Town, a UNESCO World Heritage Site. 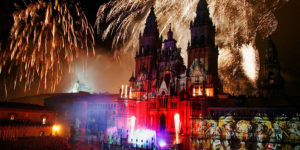 The group will spend two nights in Santiago, where you will experience the famous fireworks and St James’ Day celebrations. This tour runs over 8 days/7 nights with dinner each night. All our tours include English speaking guides and airport transfers to and from Santiago Airport. 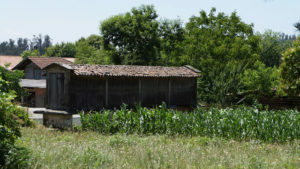 This Camino guided tour departs on specific dates. You will arrive today at Santiago airport where you and your group will be picked up and brought to your accommodation in Sarria. 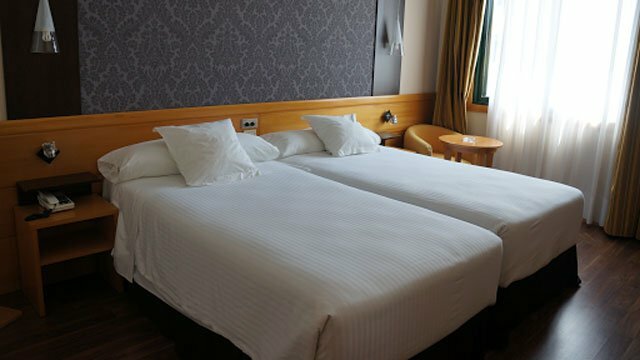 You will have some time to settle in, before having dinner at the hotel this evening. During dinner you will get the opportunity to meet your guide and fellow members of your group. Either before or after dinner you should get a little time to discover the town of Sarria. 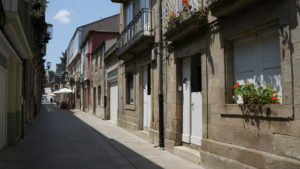 After breakfast this morning, your group and your guide will leave Sarria and make your way to the lovely Portomarin. Sarria is the most popular starting point of the Camino de Santiago with thousands starting their journey here every year. In the town centre where you will find churches, chapels, monasteries and seven pilgrim hospitals. The main street, Rúa Maior, has a nice atmosphere, where you can relax while enjoying a drink or bite in one of the nice cafes around. Visit the Igrexa de Santa Mariña with its evocative pilgrim mural, the castle fortress and the Magdalena Monastery. Once you arrive in Portomarin you and your group will enjoy dinner together after which you can rest for the evening. After breakfast this morning you will begin your second walking day, from the lovely village of Portomarin. 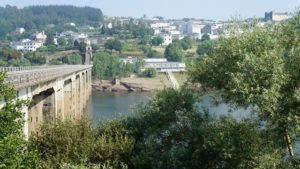 Today the Camino will cross the river Miño (Galicia’s longest river) and rise uphill steadily towards the Serra de Ligonde. You will pass nice hamlets such as Gonzar and Ventas de Narón. Stop to visit the Romanesque Church of Santa María in Castromaior and the Romanesque church in Eirexe, with its portal featuring a sculpture of Daniel with animals, as well as Pilgrim Santiago. Tonight you will finish up your walk in the town of Palas de Rei. Relax and have a glass of wine after dinner in the company of some of your fellow group members. Once again after a great breakfast, you will say goodbye to Palas de Rei and continue along your journey to Santiago de Compostela. Today the Camino crosses several streams, sleepy villages and follows a mixed forest track and road trail. 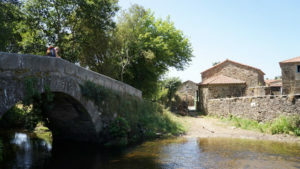 You will pass through the busy town of Melide before you reach the village of Boente and the church of Santiago. Next is the pretty medieval hamlet of Ribadiso and finally the town of Arzúa (389m), famous for its local cheese. In Arzúa, you should visit the churches of Santa María and A Magdalena and here in Arzua where you will finish up your walk for today. Today’s Camino after breakfast will take your group through pretty woods, sleepy villages and across streams for most of the day. The chapel of Santa Irene, with its unique statue of Santiago, is worth a visit. En-route, don’t miss the lovely hamlet of Rúa (310m). The rest of the route to Amenal is along a mix of good and calm country roads and forest tracks. This morning you will have a walking tour of the city which has been a UNESCO heritage site since 1985 and home to one of the oldest universities in Spain. The tour will take you to all the highlights of the old town. After your walking tour you will take a tapas tour in the city where you can sample all the local delicacies and later that evening you can watch the fireworks to celebrate St James Day. After breakfast the next morning, use your remaining time to explore the beautiful old town in Santiago de Compostela. You will be dropped back to Santiago airport where your guided tour with us will end. We hope you enjoyed your trip and made some lasting memories. Group Transfers to and from Santiago International Airport are included as part of this guided tour. All our guided trips include: accommodation with private bathroom, luggage transfers (one bag per person, up to 20kg), friendly English speaking guide, airport transfer for the group *, dinner each night*, holiday pack and maps, 24/7 support number during your trip and GPS files. *If you have requested additional days before or after this tour, dinners and free airport transfers on those days will not be included.